XENIA — Greene Memorial Hospital’s Cardiac Rehabilitation Unit has some new equipment courtesy of a grant from the Greene Medical Foundation in partnership with Otterbein Senior Lifestyle Choices based in Lebanon, Ohio. The department purchased three new commercial use treadmills with the $6,000 grant. The department sees approximately 100 patients every day. These are new patients that come through acute care at the hospital and maintenance patients. 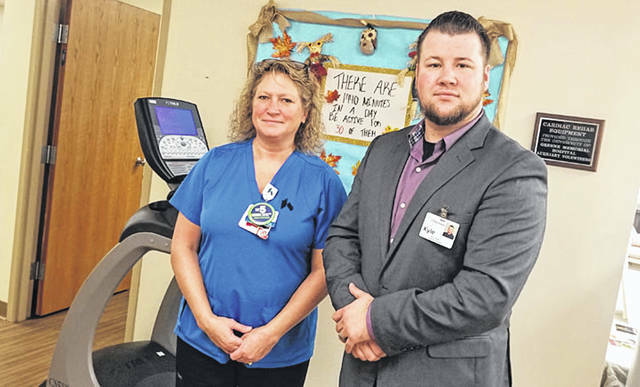 Greene Memorial Hospital’s cardiac rehab program works in three phases. The first follows immediately after treatment for a heart attack or heart surgery, then once a patient is discharged from the hospital, phases 2-3 are essential in the patient’s long- term recovery. Phase 2 is 36 sessions of monitored exercise therapy. The patient will be connected to a heart monitor and be in the care of advanced cardiac nursing staff. Phase 3 is the maintenance part of the program, which allows the patient to continue to exercise while being in the care of staff. In addition, patients receive counseling on diet and stress reduction. Farkash explained that many patients come and stay at the facility to continue therapy exercise as they appreciate the atmosphere and the comradery of patients inspiring other patients. The Cardiac Rehab Unit is accredited through the American Association of Cardiovascular and Pulmonary Rehabilitation (AACVPR). The unit provides improvement in exercise tolerance, functional capacity and blood pressure control. All patients are supervised by a cardiologist and their progress is reviewed each month. “This new equipment will allow us to better serve patients with peripheral artery disease (PAD) to improve their ability to walk independently without pain. This circulatory disorder can cause severe, debilitating pain in the legs, causing many people to become dependent on a wheelchair or need significant assistance from others just to complete their daily activities,” Farkash said. “Multiple studies have revealed that supervised exercise therapy can more effectively offer relief than surgery, which is why we are excited to begin offering this service,” Farkash continued. The new treadmills are more advanced and designed for continual use as they are in high demand in the Unit.